Here's my card for the current sketch at Freshly Made Sketches. 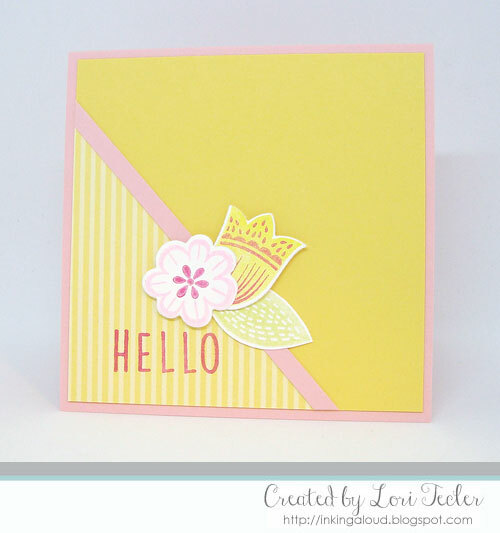 I used a pastel color scheme and floral stamps from Reverse Confetti for this sweet square design. The flowers are from the Blooms 'n Buds stamp set. I stamped them in pigment inks, then cut the stamped images out with the matching dies (except for the leaf--I seem to have misplaced that die somewhere . . .). I picked a yellow patterned and a yellow solid paper to coordinate with the colors of the flowers. They were adhered to a pink card base with a narrow strip of pink cardstock covering the seam between the two yellows. After settling on an arrangement for the flowers and leaf, I adhered them to the cardfront, using foam tape on the flowers for dimension. 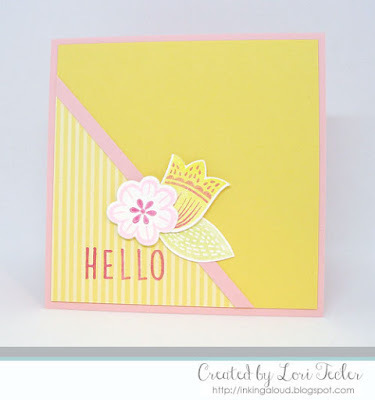 The "hello" sentiment from the Whole Lotta Happy set was stamped in the lower right corner of the cardfront in bright pink pigment ink to finish the card. This is so soft and pretty, Lori! Gorgeous, fresh and beautiful card! Thanks so much for joining us at Freshly Made Sketches.